This week for a 2nd year our earth will conducting a one hour nite without any lights but only with a star and the moon shining through the sky. This is a natural light that shines earth before Thomas Alva Edison created light bulb and before human knows how to sparked fire. 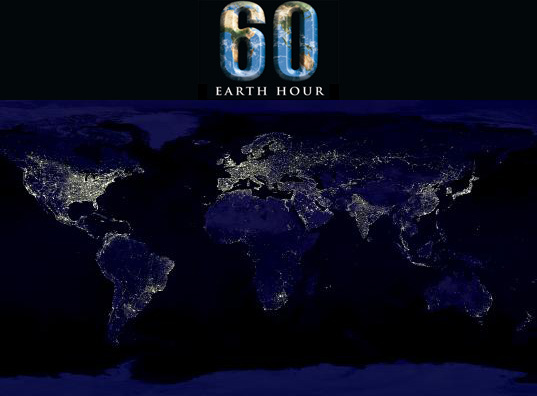 Earth Hour, as the event is being called, was inspired by a similar demonstration in Sydney, Australia last year. On March 31, 2007, more than 2.2 million Sydney residents and more than 2,100 businesses switched off lights and non-essential electrical appliances for one hour to make a powerful statement about the leading contributor to global warming: coal-fired electricity. That single hour accounted for a 10.2 percent reduction in energy consumption across the city. Global icons such as a Sydney Opera House went dark, weddings were held by candlelight, and the world took notice. What began in 2007 as one city’s dramatic stand against global warming has become a worldwide movement in 2008. Sponsored by WWF—a conservation group that is aiming to reduce greenhouse gas emissions from electricity generation by 5 percent annually—Earth Hour 2008 has the official participation of 24 cities, thousands of businesses and untold numbers of individuals worldwide. Wondering what you can do after the lights go out? WWF suggests several possibilities, such as dinner by candlelight (preferably with Earth-friendly beeswax candles), an Earth Hour block party, or a nighttime picnic with family or friends. Even it's for only 1 Hour but it give lots of benefits to us and our environment, especially our planet Earth (the 3rd rock from the sun). The goal, of course, is to inspire people to reduce their energy consumption every day, not by sitting in the dark for an hour each night, but by taking simple steps that can have a dramatic effect. Switch to energy-efficient CFL or LED lights instead of traditional incandescent bulbs (even Thomas Edison, who invented incandescent bulbs, was a proponent of renewable energy and reducing energy consumption). Lighting accounts for about 5 percent of residential greenhouse gas emissions. Turn off or unplug computers, televisions, cell-phone chargers, microwave ovens, and other appliances and electrical devices when they’re not in use instead of leaving them on standby. Turn off lights when you leave a room or finish work for the day. Encourage your company to shut off lights and unused appliances when no one is working. Get a free home energy audit to help you reduce your energy consumption, and switch to green power if your utility company offers renewable energy options. Use less hot water. This will not only save water, it will also reduce the amount of electricity (or natural gas) you use to keep water hot. No need for us to ignore it after all, 27th March 2010, from 8.30 pm until 9.30 pm all over the world.. i'm using Malaysia time (+8.00 GMT).. Only 1 hour, right? But like last year, i heard some dumb Akademi "Pantat"sia fan said they don't want Earth Hour. What an ignorant butch!! Our planet our own responsibilities... we can play the role as captain planet, in our own style. Think wise and be the saviour. It's only 1 hour.